I love it when people are literal in naming of places. Obvious names, like Steep Canyon, are more fun than British aristocratic names, like any number of Jamestowns. Even modern desires to somehow connect with ye olde England leads to stupid modern subdivision and cookie-cutter home names like The Kensington. The neighborhood adjacent to mine had such cool street names as Rusty Rail Road and Good Neighbor Trail. But not all of the names are awesome there, either. The roads where I live all have the word forest in them, which is more confusing than useful. But it's better than Lamplighter Lane or Yorkshire Trace. The point is that fancy names are only fancy as long as fancy people live there, and that's why I'd argue for more pragmatic names in new development. You know, like Indian Burial Street or Landfill Lane. 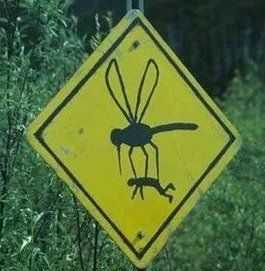 Isn't it great that most of Florida's First Coast was once called Mosquito County? Historically speaking, it was Musquito land from around 1500 until the mid-1800s. And it probably was named after mosquitos for a good reason. Also, when a region has all kinds of bugs everywhere, you're not going to name it after the king of Spain, so it just made sense to be literal and obvious. Like my street could be Parked Full Driveway Trail. Or Irma Debris Way. Or Big Pickup Street. I for one think we should return to Mosquito Coast instead of First Coast, but I also know that if I lived on one of many Brougham Streets across the country, I would go and buy a Cadillac. Anyhow, I think we should all come up with literal names for the places around us. Have fun.